A few years back, as newly-transplanted Nashvillians, your Nashvillest editors quickly learned to navigate the streets of Nashville as only a broke couple of college kids could do. Just about every weekend, you could find us at one of two places – Eating budget tacos at SATCO or pawing through heaps of used CDs at The Great Escape (sometimes both). 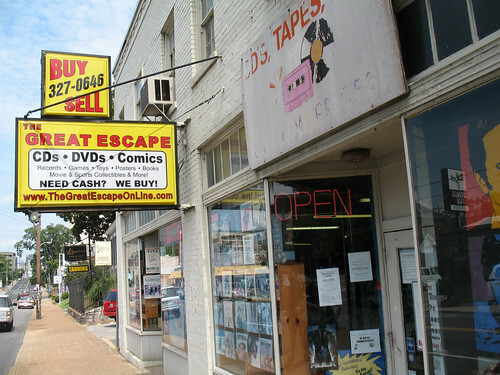 And that’s why we’re pretty bummed to hear that the Great Escape’s 33-year-old flagship store on Broadway will be closing down on Sunday, October 17 and consolidating with their newer Charlotte Ave location. It’s not all sad news for Great Escape enthusiasts, though. While not within walking distance for carless, penniless freshmen, The Great Escape on Charlotte Ave will become something of a “Super Store” and carry twice the inventory, plus a super-discounted outlet store open 7 days a week. The Charlotte Ave Great Escape just recently reopened after spending three months cleaning up from the May flooding, and it should make a cozy new home for all of our dusty Great Escape memories. Read the full email sent to The Great Escape newsletter subscribers here. RIP, Great Escape Broadway – Downtown Nashville and future generations of broke college kids will miss you indeed.